For those of you who are lucky enough to have enjoyed Hutch Kugeman's brews at Great Adirondack in Lake Placid...you're about to be joined by a multitude. Hutch is leaving Great Adirondack (no worries; his former assistant Paul Fryman is returning from Snake River Brewing to take over) to become head brewer at Ithaca Beer Company, effective this weekend. Congratulations to Hutch and Ithaca: this is great for all involved. Looking forward to more success from all parties! Last round: here are some bars that I was thinking about putting in PA Breweries 4th edition that, for one reason or another, I didn't put in the manuscript. If you think some of them really deserve to be in, let me know, and tell me why. Again: if you don't see a bar here, chances are it's already in the book! Two more rounds, actually. Again: if you don't see a bar here, chances are it's already in the book! Okay, here we go again: I have most of the good ones in the Philly 'burbs, but again: haven't been to some of these, or haven't been recently. Are any of these must-haves? As I said, I sent the completed manuscript for Pennsylvania Breweries 4 in last week. But...since then, I noticed that I'd screwed up and missed a few bars in Philly, and I've been reconsidering. Can you give me a little help? I've made my choices, and a few of the definite adds (like Beneluxx, which was simply a brainfart on my part). But these...I either haven't been to them (like Devil's Alley), haven't been to them recently (like Union Jack) or I'm on the fence (like Mad Mex). So do me a favor: take a look at this list, and pick your TOP FIVE that you can't believe I haven't put in...and I'll think about it some more. Looking for a little advice, folks; thanks! I just got the news that a family friend died: Gus Dobish, a long-time friend of my in-laws, father of my brother-in-law Chris's wife Katie, and a larger-than-life guy who always had a story. He had plenty of life experience to draw on, too: Gus worked as a pharmacist for years, was also an actor (including a performance as a heart attack victim in a hospital plan commercial that was so realistic that people contacted the hospital to see how he was! ), and late in life got his law degree, becoming so successful that he was a vice-president with Rite-Aid. Gus always had something going on, had energy popping off of him, and could do a beat-pause in a story better than anyone I know. My heart goes out to his wife, Nancy; to Katie and Chris and their kids, and to his other two daughters, Deb and Heidi. We lost another good friend last week: Edith Lelak, who was Thomas and Nora's "nanny" when they were babies and I was still working corporate. Edith and her husband John quickly became a third pair of grandparents for the kids, and as my father said, "If I couldn't be there for the kids, I can't think of anyone I'd rather be there than John and Edith." She was a loving, sweet person who the kids simply adored. The two of them sang with me at her funeral last Thursday; we sang The Prayer of St. Francis. Go with God, Edith, Gus. So Friday I kind of bumbled through the day, getting caught up on phone calls and e-mail, writing scripts for the interviews I'm conducting this week for a few stories I've got to do. I did platelet donation in the morning, and it went smoothly, and sang a confirmation mass in the afternoon. Thomas was in Harrisburg at a mock trial state final competition, so Cathy and Nora and I went out for Chinese; got Szechuan (or however we're supposed to spell it these days) seafood, which was tasty, and split a bottle of Stone 8th anniversary, the "imperial mild," and it was good (though I probably should have had it when I got it), rich but very drinkable, and imposing enough to handle the spice. Then we went home and watched more of Season 1 of Heroes. Saturday was crazier. Cathy left for Harrisburg at 8 to visit with an old friend of her family who is in the endgame of a nastily rapid bout of cancer. Thomas left Harrisburg at 8 to return here. Nora and I left at 8 to take her to Drexel for another robotics competition, and I came back and sang another confirmation mass (we had about 250 kids in the parish being confirmed over the weekend). When that was done, I went back to the house, picked up Thomas, and we drove north to Hellertown, to have lunch at the Braveheart Highland Pub. I had a pint of O'Hara's Stout, we split the smoked fish plate (excellent), and I had a caesar salad with grilled shrimp. A very nice lunch; then we hustled him over to Southern Lehigh HS for his final regular season forensics tournament, qualifiers for the national tournament (he made it to the final round today, but didn't quite make the cut). I drove back to Drexel, picked up Nora, drove home, met Cathy, we all changed. Drove to Nora's school, dropped her off with a friend's family for an overnight birthday party, and we drove to the annual fundraiser auction at Holy Ghost Prep. I had offered a basket of three whiskies (Tomatin 12 Year Old (from John Hansell), a 1994 Knappogue Castle, and a bottle of Rock Hill Farms bourbon) with a sub to Malt Advocate, a book on Islay whisky (Peat Smoke & Spirit), and some other stuff; and also offered an in-house tutored whisky tasting -- 13 whiskies -- with cigars and snacks. That met some brisk bidding and wound up going for $1200; felt pretty good about raising that much for the school! We had dinner with the auction: lobster tail, lump crabmeat, sushi, poached salmon, stone crab claws, huge shrimp, and a crab casserole...all delicious. I shared around a bottle of Bernheim Wheat Whiskey and a bottle of Parker's Golden Anniversary (gave some of each to the two guys who bought the whisky tasting), had a couple beers (Lager...and Weyerbacher Muse). Then we went home and crashed...Only I'd had a big coffee on the way home from Drexel, and wound up reading till about 3! Yeah, the day after finishing Pennsylvania Breweries 4 is that kind of day. Adios, amigos! Seriously: does anyone know where I can get more 50 ml thimble glasses like this? I want real simple ones that I can put ice cold vodka in for a zakuski party I want to do, about two dozen of them. Drop me a line; thanks! Finally put something up on the Session Beer Project blog. I don't want you all clicking over there just to find out that it's essentially a link to another story, so I'll just link to that story: The Untimely Death of The American Session Beer. It's not just ranting and hand-wringing: Ken Weaver got some numbers to back it up. Good stuff, though some objections could be made. Today, the Ziggy comic (which is the way this 'entertainment' should be referred to) makes a joke about the federal bank bailout, approximately 17 months* after it happened. Ziggy celebrated the moment by continuing to wear pants (a huge thank-you to Stephan Pastis for that). The Brewers Association, the not-for-profit trade group dedicated to promoting and protecting America's small and independent brewers, is pleased to announce its 2010 board of directors. Following member elections last fall, the Brewers Association seated the following new officers: Nick Matt of Matt Brewing Company as Chair; Sam Calagione of Dogfish Head Craft Brewery as Vice Chair; and Mark Edelson of Iron Hill Brewery & Restaurant as Secretary/Treasurer. Richard Doyle of Harpoon Brewery is Past Board Chair. Hmmmm... All East Coast brewers. Are they the only ones who want to do the work? Are they the only ones with the time? Or were they just not at the nominating meeting? Congratulations the the new Board! Devil's Den is hosting a Duvel Green event tonight. A brewery rep will be there, and Duvel Green drafts are a dollar off from 8-10. Nothing about glassware, which is too bad: the Duvel Green glasses are sweet. Please note that Duvel Green is clearly on the PLCB's brand registration list, and was even before the infamous Memphis44Resurrection Raids. It's still good to see a brewery rep here in Philly standing up to The Man. Quick note of congratulations (and a heads-up to real ale lovers in Lancaster County): Paul Pendyck, the beer engine guru of Lancaster, has opened the Bulls Head Pub in the General Sutter Inn, at 14 E. Main St. in Lititz (it's so new the website doesn't reflect the change yet). The inn has been hosting regular cask ale nights, but the Bulls Head will have two casks on at all times. Now I can visit and get some exquisitely well-cared for real ale on my schedule, and that's great! So, apart from two good brewpubs, when is Lancaster city going to step up? Beer has been languishing there for years; McFly's is gone, Quips has gone downhill... I hear Crush is good, but it's a wine bar! The bar at the Lancaster Arts Hotel is good, but it's really more a restaurant. Where's the beer bar Lancaster deserves? Quick post, because I'm really busy, but something has to be said, because we're getting hosed again. Today is a big day for the beverage alcohol industry on Capital Hill. The House subcommittee on Courts and Competition Policy is holding a hearing on "Legal Issues Concerning State Alcohol Regulation," which is Congress-talk for "the three-tier system." Where did it come from? According to Wine & Spirits Daily, "This sub-committee hearing was said to be ushered along by the National Beer Wholesalers Association, and is to focus on the state-based regulatory structure of the US alcohol beverage industry, in contrast to the more deregulated UK industry." But producers don't want the hearings because no one really knows what's going to be said or what's going to come out of it. · Rep. George Radanovich, 19th District, State of California -- a winemaker, so likely on the side of deregulation. · Mr. James C. Ho, Solicitor General of Texas, Office of the Solicitor General, Austin, TX -- as SG, he's on the side of prosecuting and enforcing regulation. · Ms. Nida Samona, Chairperson, Michigan Liquor Control Commission, Lansing, MI -- a Michigan regulator, likely will fall on the side of regulation. · Mr. Stephen Hindy, Chairman and President, Brooklyn Brewery, Brooklyn, NY, brewer. · Ms. Pamela S. Erickson, Chief Executive Officer, Public Action Management, Scottsdale, AZ -- former regulator and consultant. · Professor Darren Bush, Associate Professor of Law, University of Houston Law Center, Houston, TX -- He went to school in Utah, and specializes in antitrust and regulation and deregulation in electricity markets. So naturally he's qualified to speak on alcohol. So who's missing? You are. Once again, there are no representatives of We The Drinkers, no one to stand up and say, "Yo! Here's why all this is not fair to us! While you're debating what's good for the industry, and the 'three-tier system,' you always forget the fourth tier, the people who have to deal with this!" And the same thing's going to happen next month in Harrisburg when the Great Beer Raids Hearing takes place. I ask you: who do you have to know to get a drink around here? Why are we relegated to the gallery and told to be respectfully silent? When's our chance? I hope the brewers who read this blog know about this already, but if you don't: you've still got time to register and attend the Great Lakes Water Conservation Workshop next week (Friday, the 26th) in Rochester, NY. Water is the biggest ingredient in beer, after all, and water rates in the Great Lakes region are going up by as much as 25%. It would be smart to learn about ways to cut back your usage. This isn't a lecture, either -- you bad bad brewers, you must stop using water! -- it's smart stuff from brewers like you (from places like Great Lakes Brewing (Cleveland) and Custom Brew Crafters (Rochester area)) that talks real processes, real equipment, and real ROI numbers. Saving water means saving money. Rochester isn't far -- I travel there often from southeastern PA, and it's only about 5 1/2 hours -- and this is something that really does concern you. Get ahead of this problem so you don't have to catch up to it later on. I've turned off the comments on this one; we were wandering off topic and getting loud. I was just at the Church Brew Works this afternoon (I'm out here with my daughter's school robotics team at the FIRST regional competition), sampling a Burly Friar Barleywine (seen at right, talked about here, and it was good: not bourbony, but drier wood spice and a little vanilla, and certainly not a flabby beer at all; I had Brant's Czech Pils, too, and it was very nice, body was about perfect). I'm talking with Brant (ran into him on the steps out front, it was a gorgeous day here), when Church owner Sean Casey walks up. We chat, he says he can't talk long, there's a state senator coming for a tour. We talked a little beer raid smack, and in walks the Senator. And Sean introduces me. Next thing I know, I'm talking about the beer raids with Senator John Pippy (R-37), who is the chairman of the Senate Law and Justice Committee, the folks who oversee the PLCB in the Senate. Good guy to know! That's when he told me that his committee and the House Liquor Control Committee will be holding joint hearings on the beer raids on April 13. There will be representatives from the PLCB, the State Police BLCE, Monk's Cafe (I assume as the owner of one of the seized brands), and Origlio Beverage. Not mentioned, you'll notice, is Brendan Hartranft and Leigh Maida, the owners of the bars that were raided first. There's more on this at Don Russell's Joe Sixpack site, and Don also has an excellent piece on just how worthless the brand registration list is; go read that now, because it will really piss you off. A couple titbits to add. First, I asked him just what purpose brand registration serves. He told me that it was for consumer protection, to tell you where the beer came from. But all that's right on the label, I said. Well, there's not that much on a beer label, he began...and I decided to let it go. More on that at the other blog later. Second, and of more interest to Philadelphians, we talked about the source of the original complaint. It seemed odd that an anonymous complaint would be taken so seriously, I said. Did the BLCE really do that on the basis of an anonymous tip, or are they just keeping the identity confidential? They know, he said; they said they had a "complaint." That means they know who made the complaint. Interesting. In all the excitement over the PLCB/BLCE raids in Philly in the past five days, there's been very little comment on an opinion piece that ran in the Inquirer yesterday. It's by Ed Klunk, the vice president of the Malt Beverage Distributors Association, and we've seen pieces like this before. Each beer distributorship in Pennsylvania is individually owned and allowed to operate out of only one location, so there's no opportunity to monopolize malt-beverage sales. But the grocery and convenience stores that are seeking to act as distributors are not subject to the same limitations, which raises the prospect of unfair competition. Actually that is unfair, and lifting the limits on distributors won't wholly make it fair. You can't expect them to suddenly come up with the cash to open five more stores. And grocery stores can sell anything they want, making them a more attractive stop than a place that sells beer, snacks, and lottery tickets. But the next argument is bogus. Because grocery and convenience stores sell a wide variety of items, they would have the ability to sell selected beverages below cost, essentially undercutting any beer distributor in the area. We have seen Wal-Mart do the same with other goods, undercutting neighborhood retailers. Wal-Mart does so partly by negotiating lower wholesale prices using its bulk purchasing power. But the company has also shut out the competition through "loss leader" pricing, willingly selling some items below cost so it can bring in customers and build market share. Grocery and convenience-store chains argue that allowing them to sell beer will improve access and convenience for customers. That's a weak argument when you consider that beer is available for carryout or on-site consumption at approximately 1,200 distributors and 14,000 carry-outs, bars, and restaurants in Pennsylvania. Did he say "That's a weak argument"? Yes, yours is, Ed! Selling beer by the bottle, sixer, or 12-pack DOES improve access and convenience for customers, especially when it's right where they buy their groceries! That's such a slam-dunk argument, I don't know why you brought it up. Are you trying to scare weak-minded people into thinking there are too many retail beer outlets? Sorry. The current system also deters illegal sales to minors. It does so by limiting beer sales to licensed locations that are highly dependent on alcohol sales. If a grocery or convenience store is cited for underage sales, it may have to padlock the beer coolers for a week or a month. But it can keep selling other stuff and stay in business. Cite a beer distributorship or a neighborhood bar, meanwhile, and it has to close its doors while its license is suspended. The financial penalty is severe. Okay, kidding aside, this is a lousy piece. Klunk really should have focused on that first argument and made the whole piece out of that. Like the case law or not (and apparently most of you don't), the state's distributors have worked under the often ridiculous strictures of The Almighty Liquor Code. Tons of paperwork, needle-nosed inspections, and they too, suffer from the case law. I worked beer retail in PA for a while in the early 1990s: throwing cases is a long day, and the customer always wants the case on the bottom of the stack. I remember one distributor telling me with heart-felt emotion how he'd really love to have a nicer store -- "with carpet, and wood shelves" -- but with the case law, they're stuck with concrete floors and pallet-jacks. Is it a monopoly? Sure. Would they like to protect it? Of course. But to toss them aside like used Kleenex isn't fair either. We need to rewrite the Liquor Code to allow these guys a fair shake. Here's one plan: give them a free upgrade to an "all-alcohol" license when the state stores are privatized. Then they could be real liquor stores, with everything from beer to tequila, and the grocery stores would just have beer. Mmmmm....package store. But if the MBDA and Krunk and our buddy Dave Shipula just keep fighting this without trying to compromise, they're going to wind up out in the cold. They need to see this coming, gear up, and go to Harrisburg to get the best deal they can. Not this kind of stuff. *It was me, at the beginning of the paragraph. I wouldn't want to deceive you. Joe Stange is reporting (at his Thirsty Pilgrim blog) that there has been a fire at the beloved De Dolle brewery in Esen, Belgium. Apparently a basement fuel tank exploded. One employee is reported injured. Bad news. My thoughts -- and yours, I'm sure -- are with the families involved; there's time to worry about the beer later. On Tuesday March 9th at 4:30pm we will tap our two-year-old version of Old Friar Barley Wine in an exclusive offering to members of our Mug Club. This wonderfully smooth Barley Wine is part of our Cavern Condition series of beers and has been aged in wood casks for over two years. The Barley Wine has been aged in Hogshead Casks. A Hogshead cask is considered the largest cask at 300 liter or 79.2 gallons at 40” height. These casks were purchased new from a Kentucky Cooperage using 100% oak with medium toasted heads. The toast in a cask is the amount or degree of charring that goes on the inside of the cask that imparts the “oakiness” characteristic noted in wine sampling. We intentionally avoided using old Bourbon casks, as we did not want any such flavors being imparted to a well-aged Barley Wine. Non mug club members will need to wait until March 10th to sample this beer. Modern refrigeration techniques were not widespread 100 years ago and the architect of the St Johns School; John Comes designed a cavern, below ground level, in which to store large blocks of ice to help with the kitchen and food service operation of the then functional school. It is in this old ice storage Cavern, that The Church Brew Works ages our select brews in wood casks and cooperage for our special cavern conditioned series of beers. 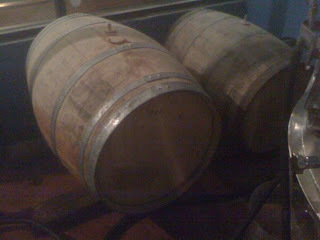 I think I have some pictures of these barrels... If I can find them, I'll add them. I just hope the Old Friar lasts till I get to Pittsburgh on Thursday...Brewer Brant Dubovick sent me a pic: thanks! If you've been wondering when I was going to say something about the ludicrously over-the-top PLCB raids on Memphis Taproom, Local 44, and Resurrection Ale House...wonder no more. It seemed more appropriate to write it at the other blog. Steg IPA (internal code name: The Reaper) is resting comfortably in Tank 25. 400 lbs of hops finished out at 17 Plato [I'm assuming that this is an OG reading] and 105.9 IBUs (this will drop during fermentation, should wind up around 75-85 IBUs in finished beer). The basic recipe is light crystal, Munich and wheat malt, with bittering from Galena and Centennial, and a MASSIVE late-hop addition courtesy of Cascade and Nugget. This was by far the largest hop bill we've ever had for one recipe - and it was for a small batch of "only" 200 barrels. It was awesome...leaving work today, the entire Valley smelled like hops! There has been some debate about releasing the IPA and the new Steg Pale Ale at the same time. Our intention was to formulate both beers to complement one another - IPA is a big beer for dedicated hopheads, and if your feeble palate can't handle the IPA, we crafted the new Pale Ale as a true session beer, between 4-5% ABV, but with a very clean, hop-centric character that allows you to enjoy 5 or 6 crisp, hoppy beers and still make it to work the next day. I followed your Session Beer Project closely last year, and I love it - too bad it took us a year to pull the trigger! Can't wait to taste that Pale. Now...can we get some Liebotschaner? 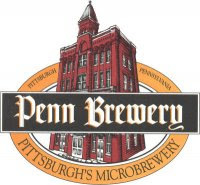 Penn Brewery is getting back in the game indeed: they have growlers, for the first time ever, starting tomorrow night, Friday. WHAT: 64 oz. growlers filled - $10 Bring your own growler, or buy a Penn Brewery growler for $5! This week's choices: Pilsner, Dark, Kaiser, and all new PALE ALE! Get on with your bad self, Tom Pastorius, this is great! I've heard from two sources that the Red Star brewpub in Greensburg will be closing at the end of March. I'm sorry to see it go; Red Star was one of the best brewpub spaces I've seen, in the old train station, and Jeff Guidos brewed some simply awesome barleywines. Sigh... They had some real trouble with street construction in the area, and had some problems with identity/menu, too (they had re-styled themselves the "Red Star Agave Grill" recently, a change which appeared to be mostly cosmetic). I do hope Jeff lands on his feet. Oh. Wait. That's the problem. Garces Trading Company includes a small area that is technically a Pennsylvania "Wine and Spirits Shoppe," even though it doesn't sell any spirits; so let's just call it what it is: a State Store, staffed by PLCB personnel. So it's not wine being sold by Garces (since that would, of course, be illegal), it's just a store inside his ... grocery store. So what. I can hear people saying it: so what?! This is great, we can get wines we can't get anywhere else, hurray, Pennsylvania's not so bad! How is it fair for Garces and Garces alone to get this deal? If this is the pilot program the PLCB claims it is, how will it be fair unless every restaurant that wants one, from Philly to Erie, gets one, and each one gets 'very exclusive wines' for their own customers' pleasure? Why, it won't be, because that would be impossible. Why not have cognac shops inside cigar shops, or rum selections in Caribbean bodegas? I said that the PLCB was arrogant in the post linked above. I may be wrong. They're a mad, blood-blinded Cape buffalo, crashing through booze retail in Pennsylvania on a destructive, random path: yes to this beer sale, but not to that one; no wine sales in grocery stores (unless it's by machine), yes to beer sales in grocery stores; exercise monopoly muscle but put on a happy face and spend almost $3 million on a name change and facelift...that doesn't matter a plugged nickel because Pennsylvanians aren't allowed to buy our booze anywhere else. Someone suggested that we should hold a mass civil booze disobedience march: a thousand citizens march across the Burlington-Bristol Bridge, get a bottle of booze at the new Roger Wilco, and march back. Are they going to arrest us? And if they do...could we finally take them to court and put a freakin' stake through the heart of a 76-year-old piece of code that should have been shitcanned decades ago? I'm about ready to start seriously thinking about it. *Again, as I've said before, I hold no animus against Garces for this. It was brilliant, the place looks as cool as an October morning, and he'd have been plumb crazy not to take the PLCB up on it. Love the food, love Village Whiskey. Hate the PLCB for doing this. There was a good discussion of the current proposal to allow beer sales in grocery/convenience stores today on WITF-FM's SmartTalk business program. I hope the recording is going to be up soon; meantime, there's a poll up you might want to vote on. I know I did. The poll is here; I hope the file for the show will be there soon. I may be on the radio about this issue real soon; I'll let you know when that happens. East End Brewing just announced...okay, Scott Smith just sent me an e-mail, same thing, that this Saturday, March 6, will be the release of both Gratitude 2009, his annual barleywine, with the colored wax and paper wrapping, and Wooden Nickel, the brewery's 5th anniversary beer, a saison. Gratitude will be available for sale, along with previous years (check out the details on Scott's "stacked vertical" packages here), cash only. Wooden Nickel will definitely be available for tasting, but may or may not be available for sale: labels are running late. and will be available for sale; thanks to Scott for this last-minute update. Doors open at noon. That is the view from a gas station we stopped at on the way to Mexico City: you can see the two volcanoes in the wispy blue sky. I wish I'd taken more pictures on the trip, but we were traveling really fast, and most times it was pretty foggy/misty. That's me addressing my people (I'm promising them more booze), overlooking the Plaza de La Constitución in the center of Mexico City (I'm standing on the top balcony of the Grand Hotel, a beautiful place, though I'm told the rooms aren't much). I apologize for the layout. Blogger's kind of rudimentary on that, and it really depends on your screen. 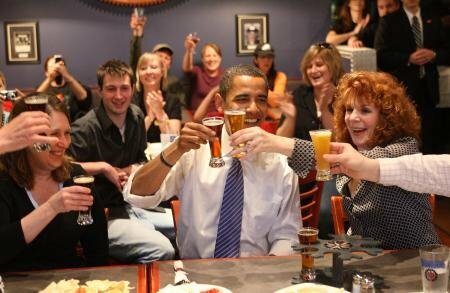 Sorry, wine folks: President Obama is still clearly a beer guy. When he made a bet with Canadian PM Stephen Harper on the outcome of yesterday's freakin' awesome Olympic hockey final, he didn't bet a case of California grape squeezin's against a case of Ontario icewine; he bet a case of Yuengling against a case of Molson. Oh yes, he did. Not that we're rubbing it in...just noting it.